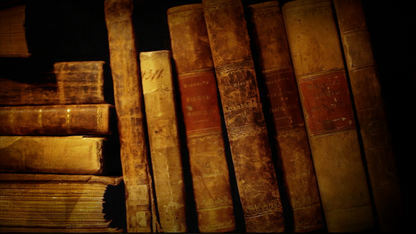 “The Tragedy of Broken Trust” recounts a side of American history that isn’t taught in schools, a story of broken promises, corruption and greed that has been veiled in our country’s history books as “Manifest Destiny” and “progress.” Most Americans are unaware of the shameful past of the United States to the indigenous peoples of the United States. Between 1837-1900, the government inflicted disturbing trauma onto tribal nations that continues to affect later generations of people. 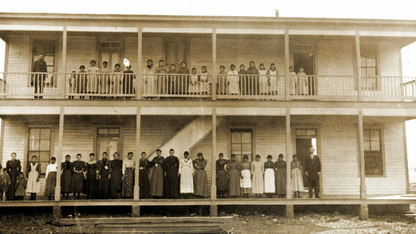 This trauma included the inability to respectfully bury the deceased during Removal, starvation, setting out rotten food for rations, distributing blankets infested with small pox, not allowing tribal groups to take tools to build houses or plant gardens in the land that was set aside for them. Less known are the betrayals and broken promises that occurred after these sovereign tribal nations started over in Indian Territory. When the Chickasaws and Choctaws were removed, the United States government signed treaties with the tribes promising them protection and land in perpetuity in the southern half of what is now Oklahoma. The treaty also assigned the U.S. Department of the Interior to handle the fiduciary trust responsibility for the tribes’ resources. In the lead up to Oklahoma’s entry as the Union’s 46th state, Congress took a series of actions to force the allotment of tribal lands and take control of, and then suspend, tribal government. 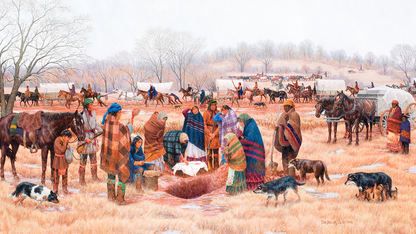 During this period, tribal citizens received individual allotments of tribal land and became citizens of the United States and new state of Oklahoma. In 1906, their voice in tribal governance, however, was suspended and Chickasaws could no longer elect their own governor. It wasn’t until Congress acted in 1970, in response to tribal advocacy, to begin the process of restoring self-government and self-determination to tribal institutions.